The Arizona Memorial in Pearl Harbor, the most popular attraction in Hawaii. Why Is This the Most Popular Attraction in Hawaii? According to rating sites, the Arizona Memorial is the most popular attraction in Hawaii. But the other attractions at this place are also very popular. Let’s examine why and why you should make the effort to visit one of the most important historic sites in the country. According to TripAdvisor, 4 out of the top 10 most popular tourist attractions in Honolulu are a part of or directly next to the USS Arizona Memorial. This includes the World War II Valor in the Pacific National Monument, the USS Missouri Memorial and the USS Bowfin Museum. So it’s no surprise that this place is the most popular attraction in Hawaii. The Navy built the iconic white arched shaped memorial over the sunken remains of the battleship Arizona in 1962. People can only travel to the memorial on boats that the US Navy operates. The USS Arizona is the final resting place of over 1,100 sailors and marines. They lost their lives when Japanese planes attacked Pearl Harbor on that fateful day of December 7, 1941. The tickets for the boat ride to the memorial are available at no cost. But there are only 4,500 boat ride tickets available on each day. Often, all of these ticket are gone by mid-day. So if you plan to visit the memorial, you should get to the visitor center as early as you can. For security purposes, no can bring bags into the memorial. But you can store them in a locker for a $3 a day. 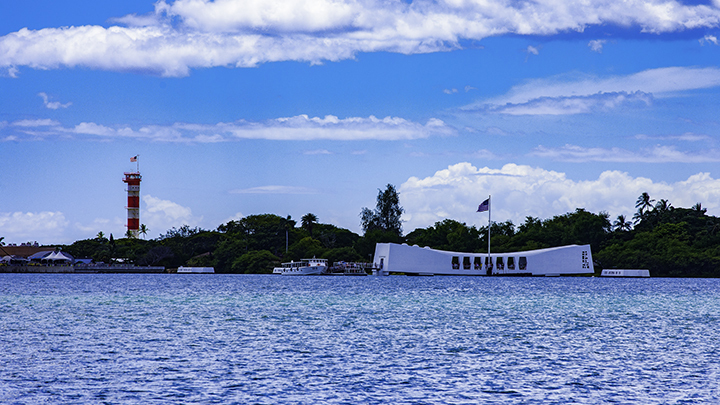 The USS Arizona Memorial is actually a part of the World War II Valor in the Pacific National Monument. President George W. Bush established the monument by executive order in 2008. It encompasses historic sites in Hawaii, Alaska and California relating to the war in the Pacific basin theater during World War II. 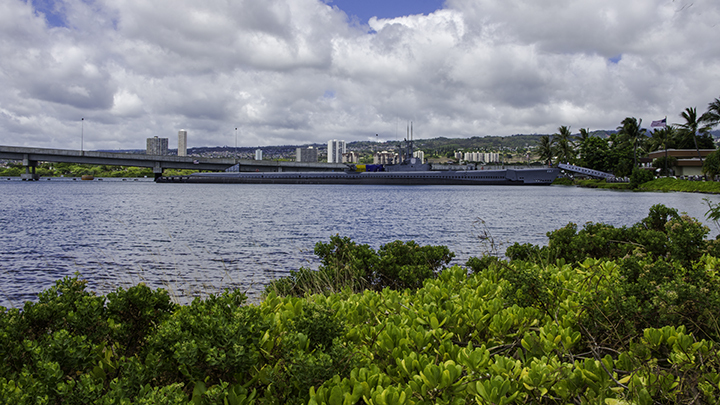 Next the World War II Valor in the Pacific National Monument visitor center is the USS Bowfin Submarine Museum and Park. The USS Bowfin was a Balao-class attack submarine that was based in Pearl Harbor during World War II. It served in nine patrols where it destroyed 16 enemy vessels. Today, the beautifully-restored vessel serves as a museum. Here, visitors can get a sense of what life must have been like on a World War II submarine. The USS Bowfin Submarine Museum also has a building and park which showcases US Naval exhibits and armaments. Just south of the USS Arizona Memorial in Pearl Harbor is the Battleship Missouri Memorial. The Iowa-class battleship, USS Missouri, was one of the most well-known warships of World War II. People also know it for being the site where Japan formally surrendered to the Allies on September 2, 1945. The “Mighty Mo” had a long service history, serving the US Navy in World War II and in the Korean and Gulf wars. The Battleship Missouri Memorial is open for daily tours. You can purchase tickets can be at the booth across the visitor center. The tickets also include a bus ride to Ford Island. This is where the decommissioned USS Missouri is now permanently berthed. The museum is a memorial to all who served on board this famous ship. 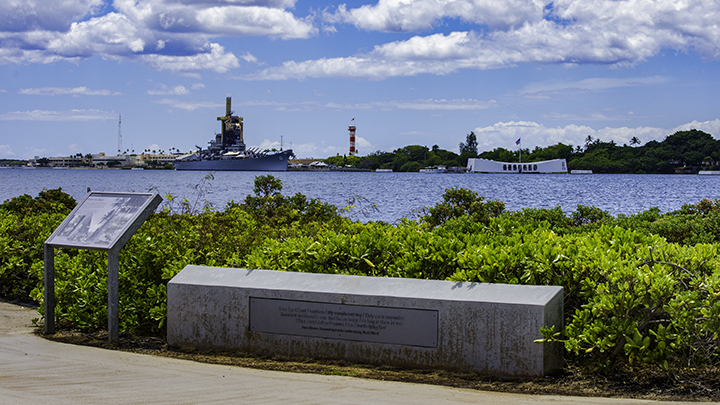 The USS Missouri and the Arizona Memorial. Right next to the Battleship Missouri Memorial is the Pacific Aviation Museum Pearl Harbor. The museum showcases World War II vintage aircraft and the role they played during the December 7, 1941 attack on Pear Harbor. It also exhibits military aircraft in service after World War II. Visitor can buy tickets to this museum at the visitor center as well as at the museum front desk.